One lucky visitor will win an annual subscription to Model Airplane International magazine by answering a simple question. The question relates to an item that appears in the October 2008 Issue 39 of Model Airplane International. Plus all the latest news and kit, accessory, decal and book reviews. 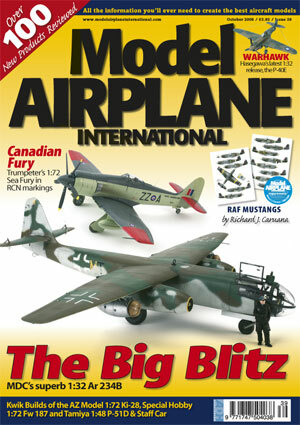 In Issue 39 of Model Airplane International magazine, who builds The Big Blitz? Select one option from the drop box below. (Hint - the answer may be found on the Model Airplane International magazine website, on the Issue 39 Preview page). Entries will be open until 25 October, and the winner will be announced on HyperScale's "What's New" page on or after 26 October.